I’m a big fan of open-ended play and evergreen toys — toys that our kids play with religiously, independently of their age. 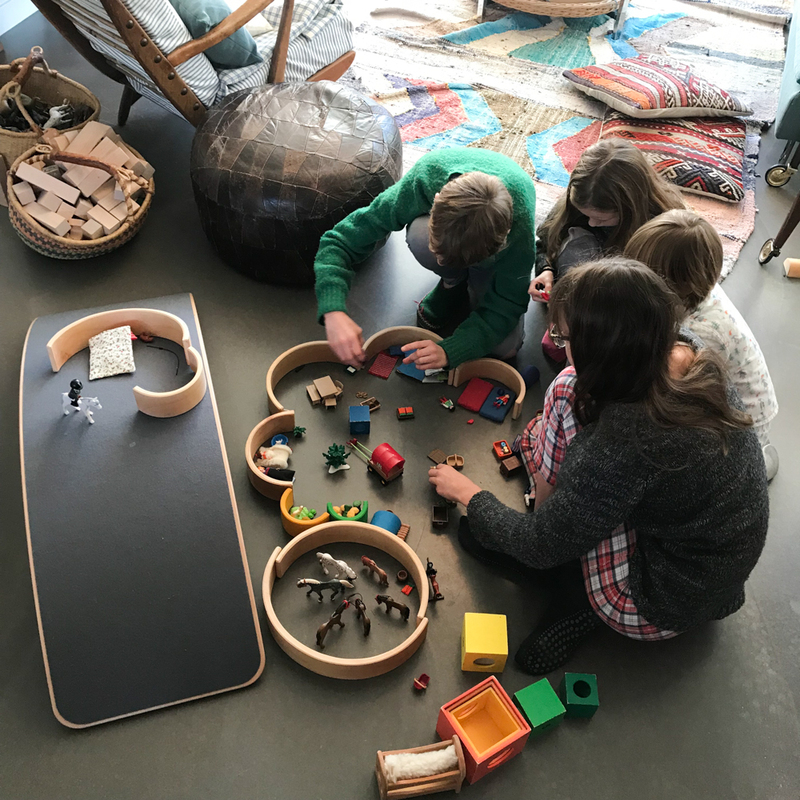 This year for Christmas, we’ve added a few toys that I feel belong to the list we created a while ago: both pretty, natural and great toys that our kids all love playing with and already have found so many different uses for. 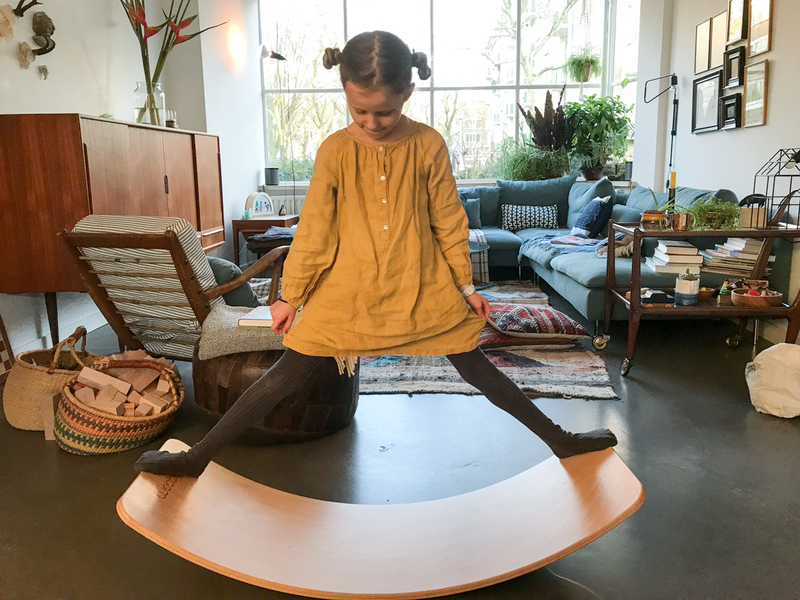 The Wobbel Board is a Dutch-designed toy which is really not much more than a very well made, sturdy wooden semi circle. There are two sizes of Wobbels, the original one is perfect for children aged 3 to 6. For kids aged 7 and older the XL Wobbel is better suited. It’s a balance board, a swing, a seesaw, a bridge, a seat, a lounge chair, a racetrack, a step, a house — you name it. The Wobbel invites all sorts of uses, both in movement as well as stable, and for older as well as for younger children. Our kids use the Wobbel daily and have even taken it over to friends’ houses because they didn’t want to part with it! The Wobbel was a bit of an investment, and it does take up some place in our house, but it is a great toy which I’m sure will be used extensively for many years to come. The other toy which I think is worth mentioning is the wooden stacking tunnel. We’ve had the small rainbow version for a few years now and it’s always used in our kids’ pretend play. I love how versatile this toy is! Smaller children can simply examine the shapes, and see them wobble. When they are a bit bigger, they can get the hang of stacking and nesting them together. 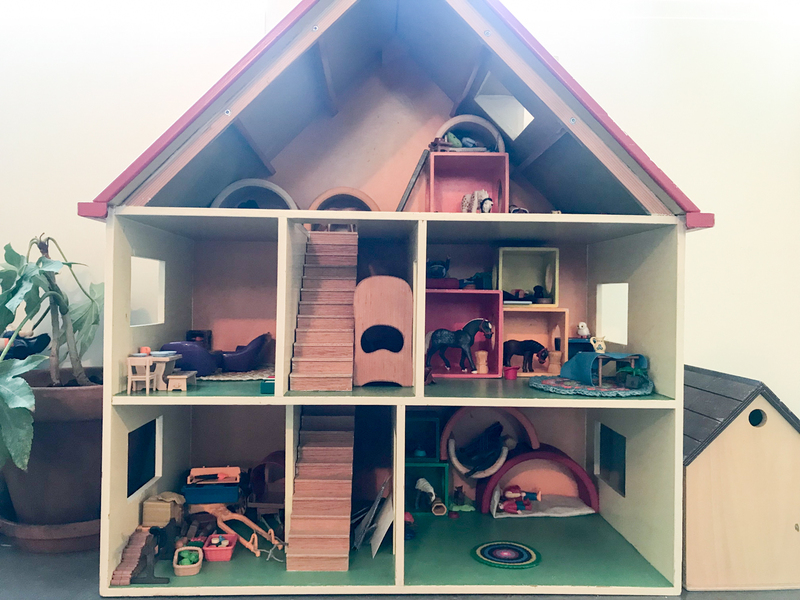 Once they start to pretend play, they can use them in all sorts of ways: fences for the animals, beds, tunnels, huts… The possibilities are endless. Our kids play with their wooden tunnels so much that I gave them the bigger tunnel in natural wood for Christmas as well, and they love it. They have been in constant use since! The wooden tunnels are definitely a great toy that children of all ages love playing with (and is also such a pretty toy to look at). We got the Wobbel board for Christmas and it’s the best, everyone that has come to our house has loved it, as have my two boys. It’s just brilliant! I love the Wobble Board! I think I will get one for us too. Did you paint one side of it? You gray side does not look like the felt they show on the website… What kind of color did you use? Hi there, did you get the unpainted, unfinished or lacquered version? Thanks! I got the lacquer version. With the felt! not that I need any more convincing, I think the wobbel board is going to be our next big splurge for the little one 🙂 btw where did you get those nesting boxes from ? they are lovely ! wow, over 10 years ! thanks anyway ! I think I would get the XL, so they can play with it for longer? But in doubt, it’s best to ask Wobbel for expert advice! I have been thinking about a wobble board for Christmas. There seems to be so much choice and different options, I’m unsure which to go for. I was just wondering which size you bought so was suitable for all your children at different ages? My children are (almost) 2, 4 and 6. Would the smaller version be outgrown in a year or so by my eldest? Or would the XL be to big for them all to manage, especially the younger ones? Any advice greatly appreciated! Thank you. I think I have seen similar wooden nesting boxes from Grimms.